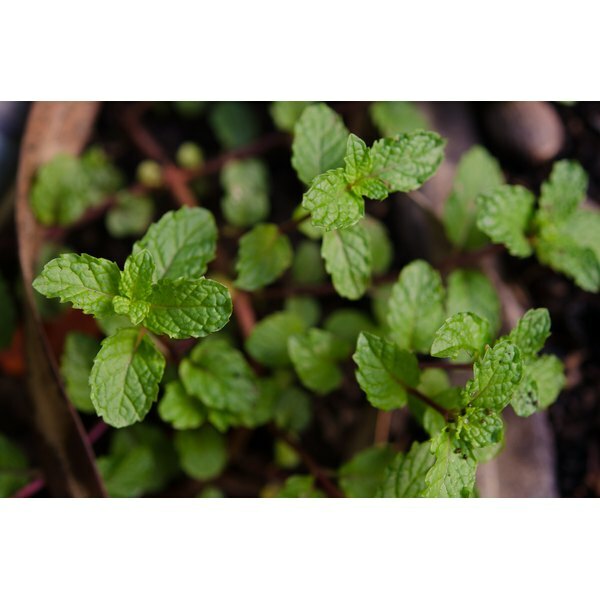 Peppermint, or mentha piperita, is used both as a flavoring for food, an ingredient in health and wellness products and as a medicinal remedy. With its anti-inflammatory properties offering a calming and numbing effect, peppermint can be used to treat digestive disorders such as upset stomache, headaches, viral and bacterial infections, skin conditions, depression and menstrual cramps. Peppermint can be found in the form of tinctures, oils, extracts, enteric-coated capsules, creams and ointments. Peppermint may help viral infections such as the common cold and flu by acting as a decongestant and expectorant. It also may be effective in treating certain bacterial conditions such as a staph infection. Peppermint contains a compound called menthol that can thin out mucus, loosen and break down phlegm and sooth and calm irritated, sore throats and dry coughs, the University of Maryland Medical Center reports. In a study published in the February 2011 issue of "Molecules," scientists showed that peppermint oil contained anti-inflammatory and antimicrobial properties against Staphylococcus aureus, which is an infection most commonly found in the nose and on the skin which leaves visibly red, swollen and painful abscesses or boils behind. High in menthone, menthol and menthyl acetate, peppermint oil can inhibit the bacterial virus and can stop the toxins emitted from the bacteria from causing any more damage to the body if the infection was already in process. Peppermint may be able to ease headaches and migraines by reducing the tension, nausea and pain when applied to the temples and forehead. According to a study published in the March 2010 issue of the "International Journal of Clinical Practice," clinicians found that menthol in peppermint can be a safe, effective treatment for the common headache and migraine. During this study, 35 participants who suffered from migraines were given a peppermint solution or a placebo. After using the peppermint solution on their temples and forehead, participants saw dramatic results, showing almost instant relief in pain, and effectively lessening the other symptoms such as nausea, vomiting, sensitivity to noise and sensitivity to light. There were no known side effects and the peppermint solution appeared to be a tolerable therapeutic alternative to other headache and migraine medications or treatments. Due to its anti-inflammatory effects, peppermint can also help treat and prevent digestive disorders such as indigestion, upset stomach, flatulence, colitis and irritable bowel syndrome by calming and relaxing the muscles of the stomach. In a study published in the January 2004 issue of "Digestion," participants suffering from an upset stomach who used an active peppermint treatment experienced significantly less gastrointestinal issues after just four weeks. After the four weeks, participants who stayed on the treatment continued to see results and at least 43 percent of them found that their symptoms completely disappeared. In another study published six years later in "Digestive Diseases and Sciences," scientists also found that peppermint helped control irritable bowel syndrome, or IBS symptoms. During this study, 90 patients who suffered from IBS were given a peppermint remedy in the form of an enteric-coated peppermint capsule or a placebo three times per day for eight days. Many of the participants after eight weeks showed less abdominal pain and at least 14 of them were completely free of abdominal pain associated with IBS. All participants who were given the peppermint capsule showed an improvement in the quality of their life and stated that they experienced no adverse effects while ingesting the peppermint capsule. Before using peppermint for medicinal reasons, it's imperative to consult a doctor. Although using peppermint doesn't appear to have any side effects, precautions should be taken by certain individuals. Those who may be allergic to peppermint could experience symptoms such as difficulty breathing, closing of the throat, swelling of the lips, tongue, or face, and hives. Anyone who has gallbadder inflammation, hiatal hernia, liver damage, is pregnant or breastfeeding should not use peppermint remedies unless a doctor prescribes it. Be aware of peppermint if you take diabetic drugs, antacids such as famotidine or cimetidine, or blood pressure medications.